UPS dropped off the i7 at my shop. I opened up the bottom to take a quick peek. First discovery is that all those battery packs you have for your Roomba 5XX, 6XX, 7XX, 8XX, 9XX, and Scooba 450 will not be able to be installed into your i7. Totally different design. 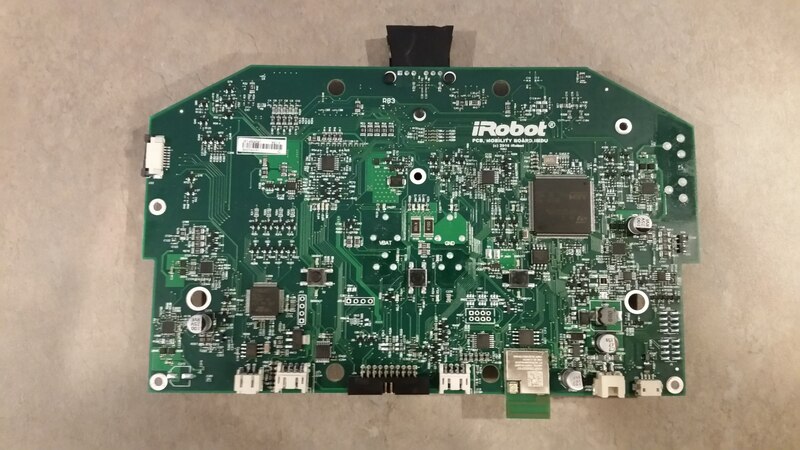 The pack is 1/3rd the size of the earlier stock Roomba packs and has a different connector and plug design. Last edited by vic7767 on September 28th, 2018, 12:28 am, edited 2 times in total. Battery performance for me was pretty good! On its first run, it worked for 47 minutes and only used maybe 1/3 battery capacity, maybe just a touch more. All hardwoods/tile though, that certainly makes it easier. Fellow hackers, seems that there is no SCI port for communication with this robot, also no key sequence from previous Roombas seems to work to access the Built in Test program. Dig in, see if you can find button pushes and/or USB port. I will switch cameras later for some better quality internal pics. Thanks for letting us indulge with you! Any clue what processor this thing uses? Yeah could we get a close up of the two big chips on the top left / bottom right? At first glance this seems a lot more powerful than the STM processor in the previous generation. jdong wrote: At first glance this seems a lot more powerful than the STM processor in the previous generation. You think so? It looks like the STM32 in the 9xx series has more I/O to me, at least. 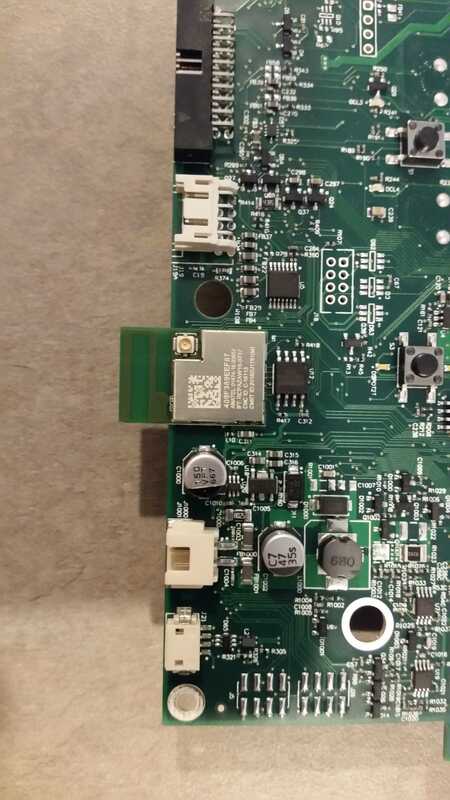 I can't quite make out the part number from the pictures, but I think it's a STM32F303, which is still in the ST32F family, but contains an ARM Cortex-M4; unlike the 9xx which has an STM32F103 containing an ARM Cortex-M3. Both chips have a maximum clock speed of 72 MHz, but I'm not familiar enough with ST chips to know all the differences. It looks like the 303's might be tailored for DSP and floating point math, and they might have more hardware peripherals too. Vic, if you feel like it, if you snap another picture of the big chip at a more oblique angle, it'll probably reduce the glare enough that I can positively identify it. Also, the closer you can get, the better. ps0001 wrote: the closer you can get, the better. I'll give it a go in the morning with a better camera and post. Could you also see if there’s any other SoCs on other boards? A Cortex M4 is hardly the massive boost in processing power they advertised. It makes me wonder if there’s more brains on another board. Otherwise it is hard to believe they can’t offer more functionality on the 980.
jdong wrote: Could you also see if there’s any other SoCs on other boards? A Cortex M4 is hardly the massive boost in processing power they advertised. It makes me wonder if there’s more brains on another board. Otherwise it is hard to believe they can’t offer more functionality on the 980. I don't see any other marked S0Cs on the board. I remove shield plate from the WiFi & camera board looking for clues but the devices are not labeled. Got a different angle on the processor and can make out most of the part number. The WIFI board looks a lot like a computer on module. Hmm is the WiFi board different from how it looked on the 980? That looks like too many components to just be a simple 2.4GHz WiFi chipset. I agree Mike. There are a lot more wires than needed for a WiFi module & video camera. That wire harness plugs into the main board. Can't trace all the copper traces. Do you see any sort of FCC ID on that board? It's interesting that iRobot (UFE) has not filed anything since 2016 (the Braava Jet). I definitely wouldn't advise attempting to remove any of the shielding. That would probably ruin your wifi performance permanently. But if we can find the FCC filing for whoever provided this module, we might be able to get internal photos from there. vic7767 wrote: I don't see any other marked S0Cs on the board. I remove shield plate from the WiFi & camera board looking for clues but the devices are not labeled. Got a different angle on the processor and can make out most of the part number. Thanks Vic! That confirms it: the i7 uses an STM32F303VE. Again, the 900 series uses the STM32F103ZE. Both have a maximum clock speed of 72MHz, 512kb flash memory, and 64kb RAM. The 303VE uses an ARM Cortex-M4 core and the 103ZE uses an ARM Cortex-M3 core. Both chips have roughly the same communications interfaces (UART, USART, I2C, SPI, CAN, and USB). The 303VE has one more 12-bit ADC than the 103ZE, for four total, but the 103ZE has more GPIO given its bigger package. The 303VE has three "advanced control" timers, whereas the 103ZE has two, and six general purpose timers, compared to the 103ZE's four; both have two basic timers. Again, the 303VE is optimized for DSP and floating point math. Like jdong said, this is hardly the huge leap in processing power iRobot advertised. I don't know how they figure it has "50x" as much processing power as the 980. Also, I don't know what specifically enables the i7 to "continuously [update] over the life of the product." Both microcontrollers have a DMA module, so maybe the i7 takes advantage of it and has external RAM, or maybe even an FPGA or something. I think that other chip in the corner is a second STM32 from the STM32F030 family of low cost ARM Cortex-M0 microcontrollers. The 980 also had a second microcontroller, but it was an 8-bit micro from the STM8S family. It's common to have secondary microcontrollers in complex designs like this to handle auxiliary functions (power management, booting, etc.). As the the price of 32-bit cores keeps dropping, manufacturers are encouraging customers to adopt 32-bit chips with less powerful cores, like the ARM Cortex-M0, in lieu of 8-bit microcontrollers. In other words, this secondary microcontroller in the i7 also doesn't account for the "50x more power" claim. jdong wrote: Hmm is the WiFi board different from how it looked on the 980? Yeah, the wi-fi board on the 980 was maybe 1x2". It was much smaller. Take a look here. jdong wrote: I definitely wouldn't advise attempting to remove any of the shielding. That would probably ruin your wifi performance permanently. But if we can find the FCC filing for whoever provided this module, we might be able to get internal photos from there. I agree, don't remove any shielding, but it'd be interesting to see what we can find by searching for part numbers. vic7767 wrote: I agree Mike. There are a lot more wires than needed for a WiFi module & video camera. That wire harness plugs into the main board. Can't trace all the copper traces. I don't know... that seems about right to me. There's no way that camera module is outputting an analog signal; I'd bet whatever image processing they're doing takes place on the daughter board, which communicates with the main board controller through some kind of digital low-speed parallel protocol. Thanks for your analysis, ps0001. But the i7's wifi module seems more similar to a smartphone or wireless router logic board. Qualcomm sells an "IPQ" family of applications processors with wi-fi on board, designed to be a one chip solution for building things like wireless routers. There's of course various Snapdragon family chips that also have client wireless solutions onboard. Mediatek has similar offerings too. Like you said, they advertised "50x" processing power. Nothing about the minor upgrades to the ST Micro parts would account for more than 2x or 3x processing power improvement at best. Probably less than 2x in my opinion. Fast smartphone-grade chips with multi-core ARM Cortex-A family processors (either v7-A or 64-bit v8) are fairly affordable. It seems pretty easy to slap one down on a robot vacuum. I'm still suspecting that the wireless module may be where the higher level brains are.